For the past year and a half I have embarked whole heartedly into my whole foods journey. I have always had more of a "natural route" approach when it comes to feeding and caring for my family. In finding out about the Weston A Price organization I had an 'ah-ha!' moment. It was like I found what I never realized I was looking for. An organization - more like a group of people - who are dedicated to eating what is nourishing to our bodies and are committed to helping others do the same. I became a member immediately and in doing so I received their quarterly journal quickly in the mail. I devoured it. I read it. I scoured it. And I learned from it. I can't emphasize to you enough of my enjoyment of reading that lovely journal. In it I found a jewel, one that I have been looking for long and hard. I have been battling diaper rash with my daughter for months. It seems like I have had an issue with it since she was born last July. It has been terribly frustrating to not be able to figure out why it wont go away and not have any home remedies work in healing her poor bottom. Weston A. Price to the rescue! In the quarterly journal there was an article about tallow balm, it's history, it's healing properties, and a 'how-to' in making your own. There even was mention of a mama using it on her baby's diaper rash and it was cured. Say no more, I decided that I was going to try it out. What was there to lose? Nothing. Absolutely nothin'. There I was, standing in my kitchen looking at something that should be in a sci-fi movie sitting on my counter top. I had made several calls earlier in the week and had walked into a local grocery store/butcher shop and finally obtained what I was looking for. 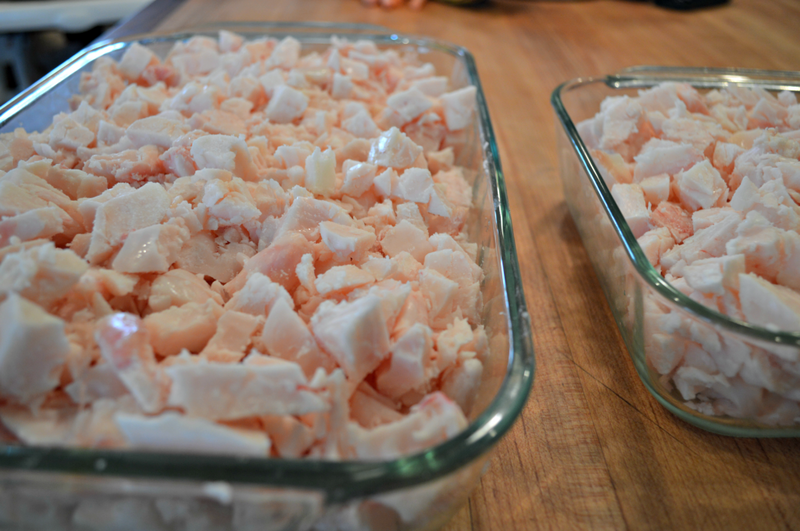 Beef tallow or as the butcher called it suet (I will proceed to call it tallow/suet since I have had so many people call it these two names). Since I have my quirks and like to have fun with my food I decided to name the newest addition to my REAL foodie journey. I'm serious, she was and is awesome in so many ways. I never knew the greatness that I had before me. Before we get ahead of ourselves, let me give you a few facts on tallow balm and why I am so excited about this. Once rendered you can cook with this, bake with this, and make your own skin care products with this. You heard me correctly. Skin. Care. Products. This is where I am heading with this post. Food tastes amazing using tallow/suet and it is full of natures goodness, but I want to focus on what it does for your skin. In the article it states that, "From biology, we know that the [human] cell membrane is made up primarily of fatty acids, a double layer, to be exact. Saturated fats constitute at least 50 percent of the cell membrane. Since saturated fats tend to be more solid than unsaturated fats at a given temperature, they help give the cell membrane its necessary stiffness and integrity for proper function...Healthy, "toned" skin cells with sufficient saturated and monounsaturated fats would undoubtedly make for healthy, toned skin. Interestingly, tallow fat is typically 50 to 55 percent saturated, just like our cell membranes, with almost all the rest being monounsaturated, so it makes sense that it would be helpful for skin health and compatible with our cell biology." I could go on, but I'll spare you. I'm hoping this will lead you to do some more reading and research on your own. Back to my baby's diaper rash. I'll admit, this was my last ditch effort before I resorted to more drastic measures. I am so glad that I tried this because it really worked wonders and I love that I'm putting something on my baby's skin that not only is helping her, but is also healing her. Tallow/suet balm is so easy to make. If your interested in learning how to do it follow along and then...get you some suet! You'll want to cut up the suet in small pieces and cut out anything that isn't hard and waxy. 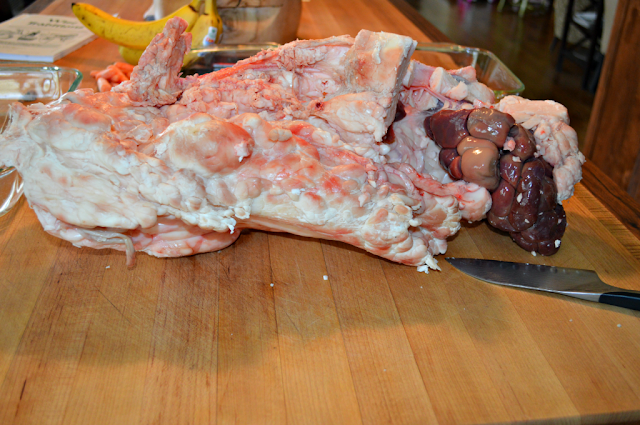 The kidney you can either throw away or if you have a dog...give the dog a treat! Franco loved his treat so much he buried it. What can I say? He's a smart one. There is major sarcasm going on here. You'll want to bake the tallow/suet for 6+ hours, or until all the fat is cooked out and the hard tissue is floating in the rendered fat. During the cooking process I took my potato masher and gave everything a good smooshing. 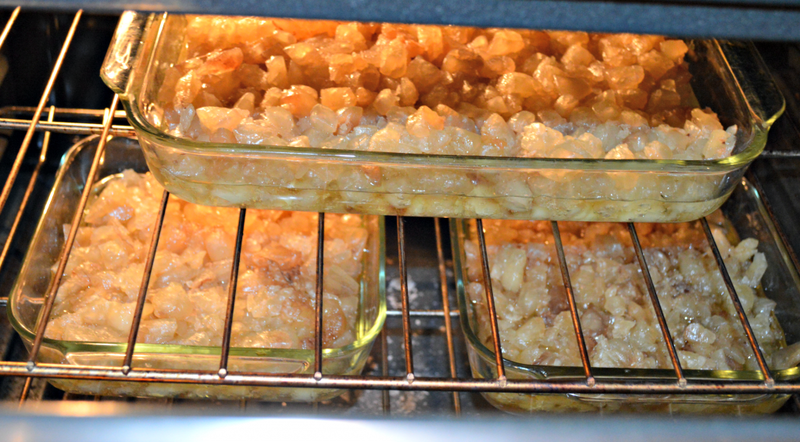 Once this step is finished you'll want to put a metal strainer over a large bowl and strain out all the large chunks. You will need to do a final strain through a cheese cloth to make sure that you got everything. I draped the cheese cloth in the metal strainer and then re-poured the fat through the cheese cloth. It was pretty simple. Don't worry about your cheese cloth, after I used it to do the final strain, I rinsed it out with warm water, gave it a good hand scrubbing with dish soap, let it sit overnight in soapy water, and then washed it the next morning with my laundry. It was as good as new. Whew, that was a mouthful! 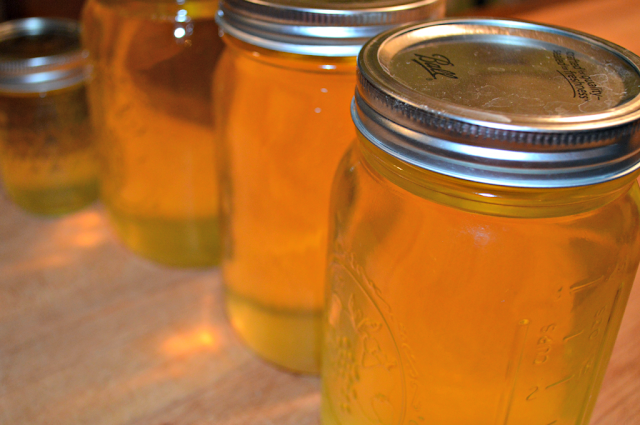 Pour your liquid gold into jars and let cool. The rendered fat will stay good for a looong time in your fridge. I use it for all my cooking now and let's just say...it's delicious. I didn't make my tallow balm right away and so I just let it all cool. When this stuff cools it turns white and once you place it in the fridge it gets hard. 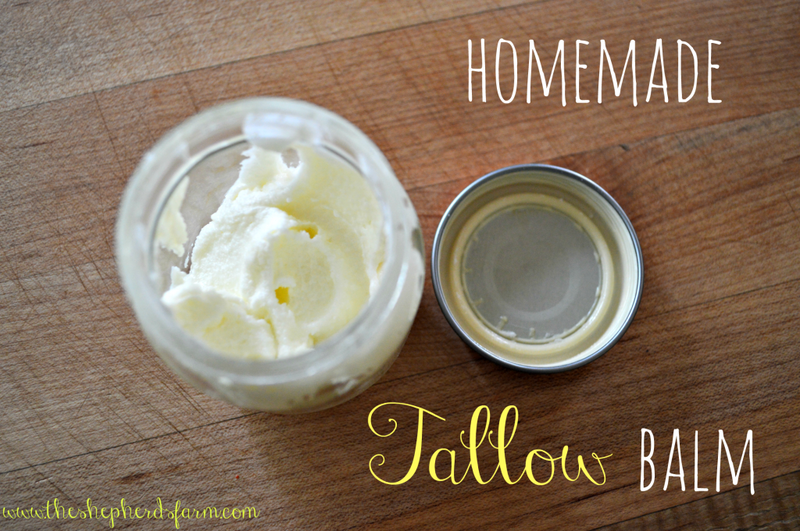 When it came time for me to whip up some tallow balm, I just took a jar out of the fridge and let it warm up a bit so it would easily mix up with my other ingredients. Long post made longer, here's my recipe for my tallow balm. Here's a wonderful skin balm that has a wide range of uses. Such as face lotion, hand and body lotion, diaper rash cream, and etc. Mix tallow and olive oil together in a small glass bowl. Once the desired consistency and scent is achieved transfer to a small glass container with a lid, keep at room temperature, and enjoy! *I would start with a few drops and then add more if you are wanting a stronger scent. You can always add more, but you can't take away. **Use essential oils that are known for being good for skin and skin health. I wouldn't use anything strong that could be an irritant. Peppermint for example would NOT be a good choice. ***I wouldn't recommend using any essential oils that aren't 100% pure therapeutic grade. DoTERRA essential oils are what I use and I highly recommend them. I hope you love this tallow balm as much as I do. However, I know that not everyone is up to making their own skin care products. If you are still wanting to have this skin care goodness but don't want to make it you can go HERE and buy some. You won't regret it. And just so you know, I also use this on my face. Don't be shocked, it's wonderful. If your in need of essential oils click HERE and you can find everything you need. *** Excerpts in this post were from the article written by Andrew J. Gardner titled, "Traditional Nourishing and Healing Skin Care". It can be found in the Winter 2012 Volume 13 Number 4 edition of Wise Traditions.